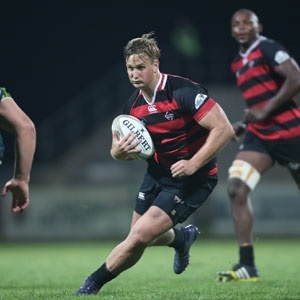 Port Elizabeth - The Southern Kings have confirmed the signing of Lions wing Anthony Volmink, while also announcing the departure of centre Jarryd Sage. “Jarryd has decided to take up an offer from rival PRO14 championship outfit Newport Gwent Dragons and will further his rugby career with them. We are extremely grateful for the contribution that he made to the Southern Kings during his time here and we wish him only the best going forward," Charl Crous, the Southern Kings' chief operating officer, said via a press statement. Twenty-two-year-old Sage, who formed part of a quartet of players who joined the Kings from the Golden Lions earlier this season, found opportunities at the local franchise hard to come by as coach Deon Davids opted for a first-choice pairing of vice-captain Luzuko Vulindlu and Berton Klaasen in midfield, with Jacques Nel as occasional back-up. Sage joins the Dragons with effect from December 1. Winger Anthony Volmink arrives on loan from Johannesburg and brings depth to the squad in a position where the recent loss of Sibusiso Sithole to long-term injury has left a gap for coach Davids to fill. “I am really grateful to the Lions for their willingness to share Anthony with us. He is a versatile player who can play at wing, outside centre and fullback and he also brings a much-needed left boot to our backline. I’m excited to see him as part of a back three along with players like Yaw Penxe, Michael Makase and Alshaun Bock,” said Davids. Davids added that he and Volmink had a “very special” relationship both on and off the field and that while the latter may not have played an awful lot of competitive rugby over the past few seasons, he still regarded him as one of the best wings in the country. Volmink made his Super Rugby debut for the Lions in 2012 and in 2013 he set a South African tries-per-game record when he scored nine tries in the Golden Lions’ 161-3 victory over the Limpopo Blue Bulls in the Vodacom Cup.